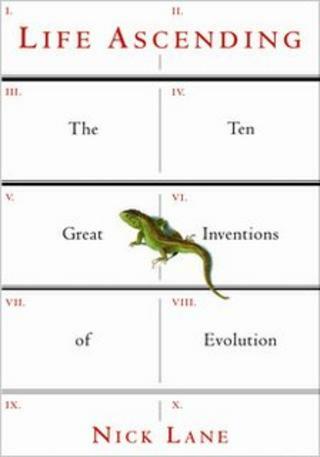 Image caption The judges called the book "an elegant guide to what makes life the way it is"
Biochemist and author Nick Lane has won this year's Royal Society Science Book Prize for Life Ascending: The Ten Great Inventions of Evolution. He joins a stellar company of past winners such as physicist Stephen Hawking and travel writer Bill Bryson. However, Dr Lane will be the last to collect the Royal Society prize. After more than two decades of sifting through the annual offerings of popular science publishing, the award is closing down due to lack of funding. Maggie Philbin, chair of the Judges, explained why they felt Life Ascending was a deserving winner. "Science writing shouldn't patronise readers, it should help them to develop their scientific thinking and apply it to the world around them, something exemplified by this wonderful and engaging book." Nick Lane said: "I've been following the prize since its inception and I know it's the highlight of the year for many scientists. The prize stands for getting the best science to the widest audience possible and I hope that it attracts funding next year and continues for as long as possible." The prize has been limping on since losing the sponsorship of pharmaceutical company Aventis in 1997. Speaking of his regret at the decision, the president of the Royal Society Lord Rees applauded the help the prize has given "to encourage engagement with science from audiences young and old" but admitted the society could no longer afford to go it alone. Set up to encourage the writing and reading of good and accessible popular science books, the award couldn't have been launched in a more auspicious year. In the same year of its founding, 1988, Stephen Hawking published his phenomenally popular A Brief History of Time - credited with kick-starting a renaissance in popular science publishing. Ironically, however, the book failed to garner the Royal Society's award. The idea of a Man Booker equivalent for science came from then editor of the popular science magazine New Scientist. At the time, Michael Kenward sat on a committee tasked with improving the public's engagement with science. He says popular science books are a good way of communicating science and it is vital for democracy that we improve everyone's scientific understanding. "Science plays an important role in all our lives, from climate change to GM and cloning," he said. "Increasingly, people are called upon to make decisions and adopt a stance on such issues and if they don't understand it how can they make an informed judgement?" Judging from sales, the prize has gone some way to engaging such public interest. This field is worth around £13m a year - solid but small beer in a total UK book market of £1.75bn. With the exception of big name authors like Richard Dawkins and Stephen Hawking, science books fail to garner the kind of media attention that fiction attracts. But figures from industry analysts Nielsen BookScan show every winning title has received a turbo boost to sales and often been given continuing momentum for years to come. One writer who particularly benefited was Philip Ball, who picked up the prize for Critical Mass in 2005. Although not a household name, Ball was already an established author - but he confesses to seeing "a step change in sales" after his win. "Obviously I was delighted," he said, "but it was sobering to realise it takes something like this to get noticed. Naively I thought if a book was good people would notice but actually, you do need this kind of help unless you are a big name." And he argues that the prize has further importance than just boosting royalty cheques. "It starts a discussion going and creates a general cultural buzz. You get people talking about where science is going and its cultural relevance." But some in the scientific community argue that there are now more effective ways of stimulating debate. "Championing book writing above all others is a very outdated model for promoting public engagement with science," suggests doctor, science writer and veteran blogger, Ben Goldacre. His book Bad Science - an exploration of the crimes and misdemeanours of science communication - sold well, even before it was shortlisted for last year's award. But Dr Goldacre believes the grass-roots activism of the internet is a better medium for public debate nowadays. "There are a huge number of science bloggers of very high quality out there, writing for free, engaging large and diverse audiences, and doing everything that the 'public engagement with science' community have wanted to do for a very long time." However, there is more at stake than effective science communication, says Roland Jackson, chief executive of the British Science Association. He argues that it speaks to our core values. "There are any number of book prizes for fiction but the Science Book Prize has been important in recognising the literary and cultural importance of science. Its loss would send a negative signal about the value society places on science."